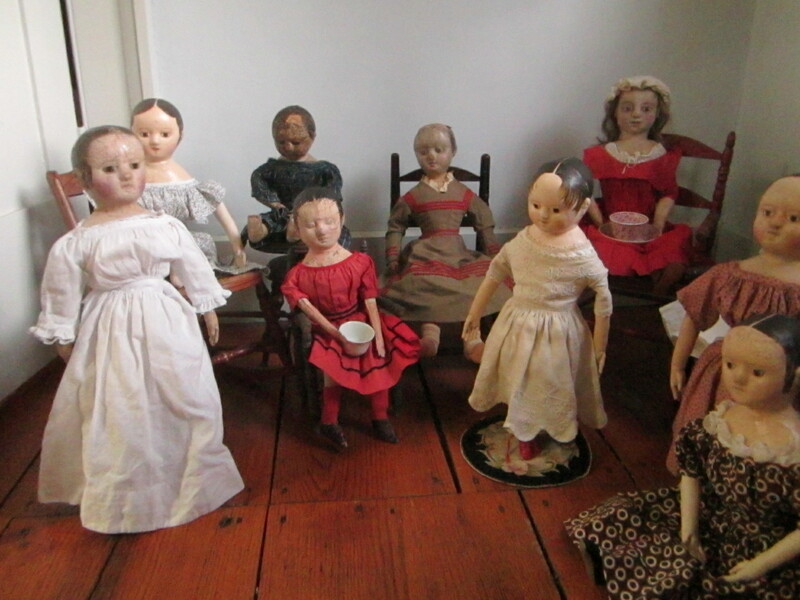 Welcome to our birthday tea party in honor of Izannah Walker, an extraordinary doll maker, who was the first woman to receive a United States Patent for her doll making method! 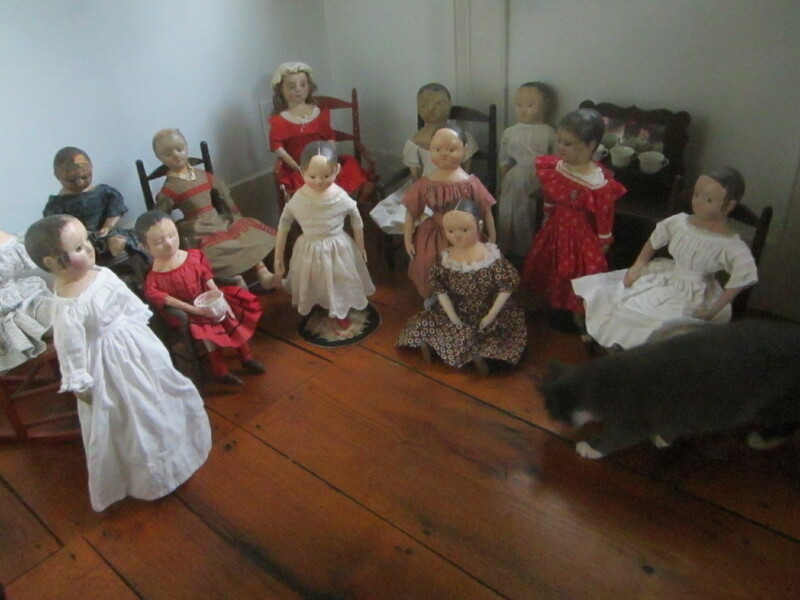 The dolls and their guests have gathered in the front parlor, while I brew a pot of tea. 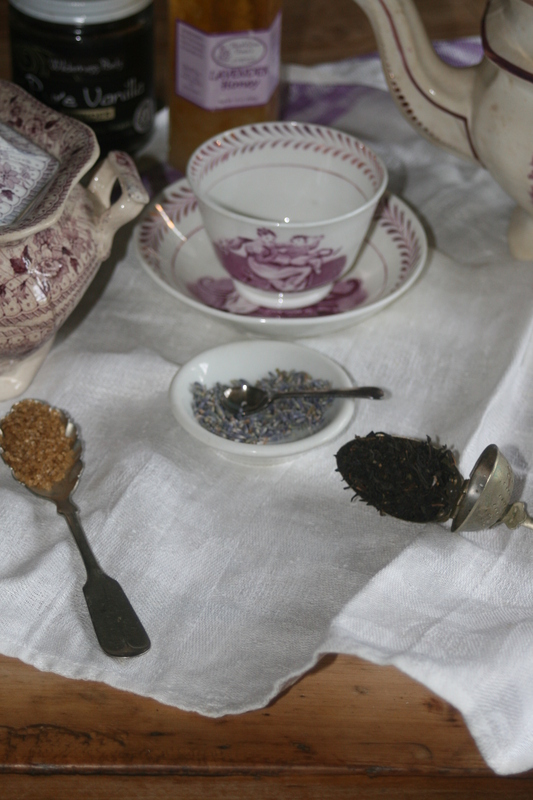 This afternoon we will be serving a combination of Earl Grey, lavender and ground vanilla beans. 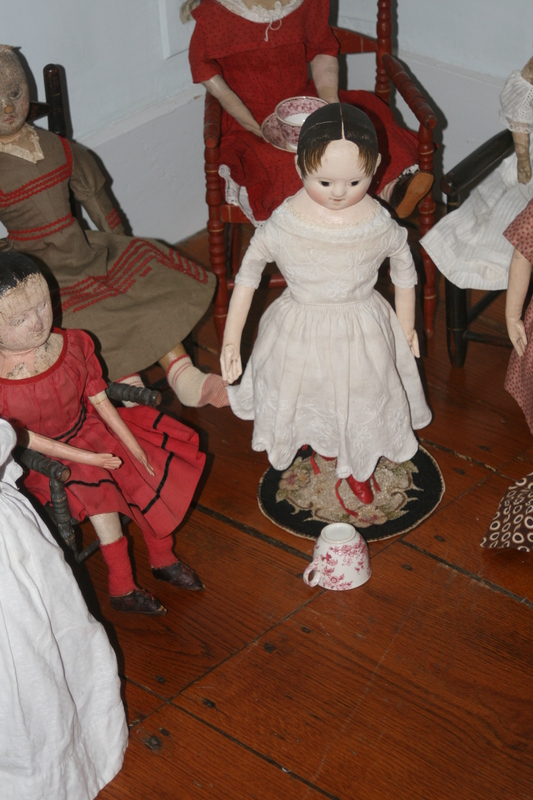 I drink mine with a bit of sugar, Isabeau and Zanna prefer lavender honey in theirs and little Izzybelle likes her cup partially filled with warm milk and a heaping spoonful of sugar, then topped up with tea! 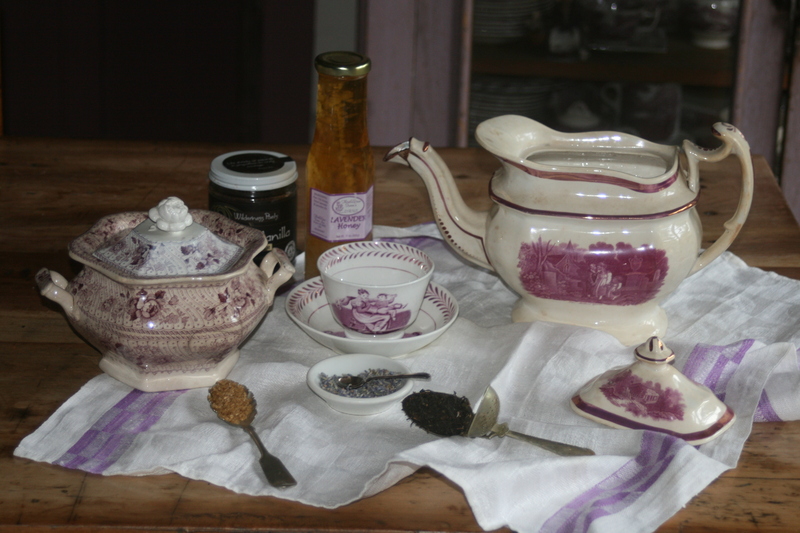 A large scoop of Earl Grey tea, lavender flowers and a pinch of ground vanilla beans… total bliss! 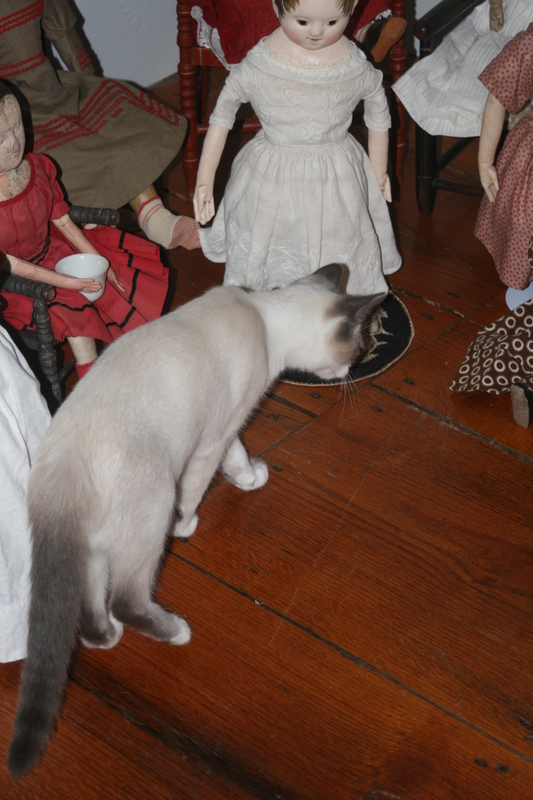 Jack very much wants to play with Billie’s doll, who is another one of our party guests. See? 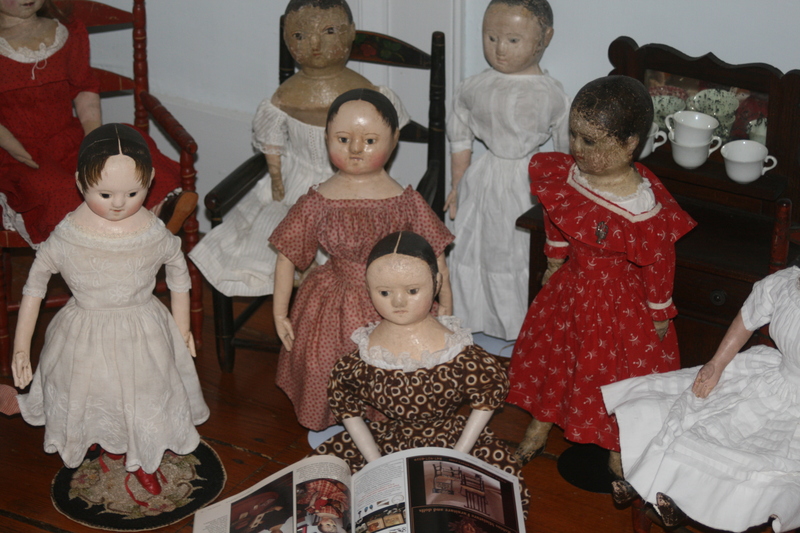 I told you that the girls loved Joy’s article about her doll house! 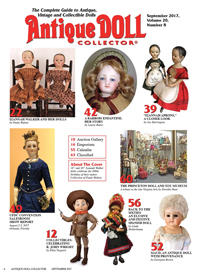 If you would like to read the article too, it is in the August 2015 issue of Antique Doll Collector magazine on pages 43-48. 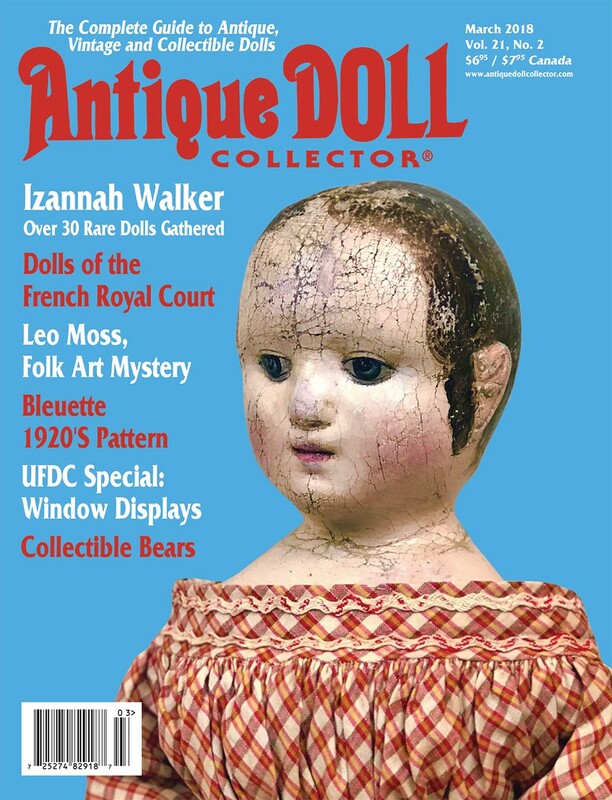 Not only does it include wonderful pictures and descriptions of the doll house, but it also shows Joy’s fantastic collection of antique Izannah Walker dolls. It is such a treat! 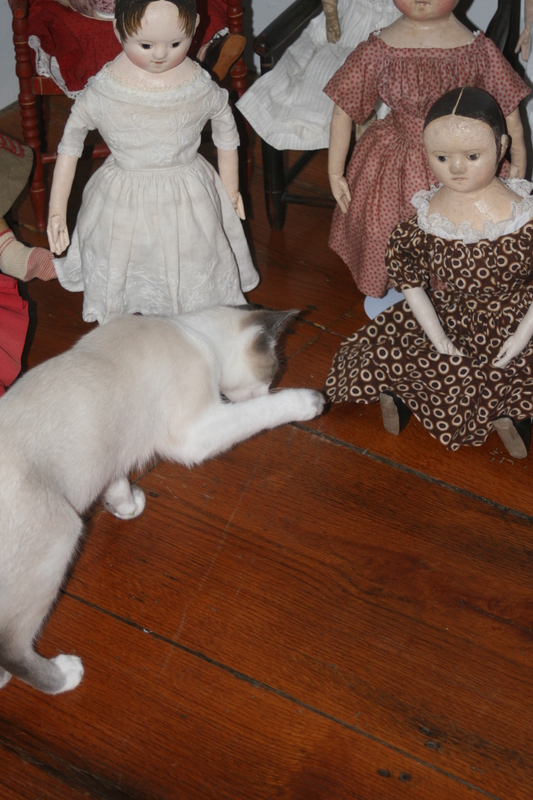 The dolls, kittens and I have so enjoyed having you visit us this afternoon! 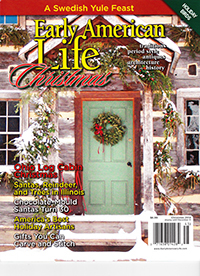 We hope you will come back tomorrow and Sunday for new posts at 10:00 a.m. & 4:00 p.m. each day, as we party on! 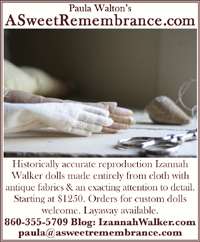 * Sharon’s and Billie’s dolls are custom orders, who will soon be traveling to their new homes. 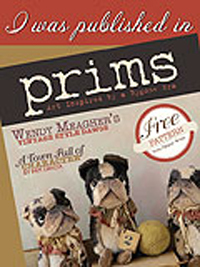 In the photos they are wearing borrowed finery. 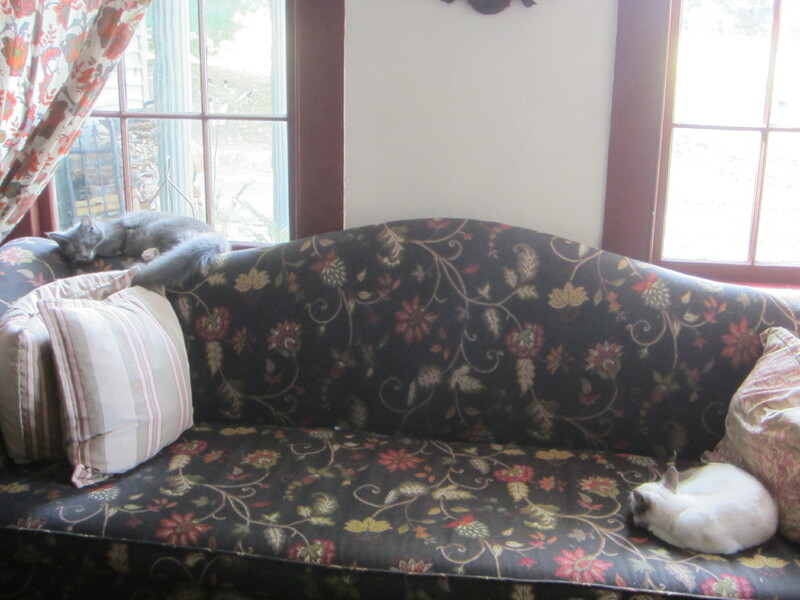 They will each be receiving their final dress fittings soon and will both have posts of their very own to show off their new wardrobes before they leave here. 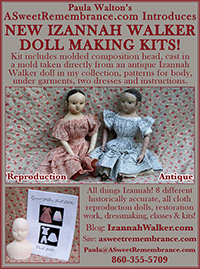 ** Lily is an antique Izannah Walker doll that is staying with me while she undergoes a bit of judicious restoration. 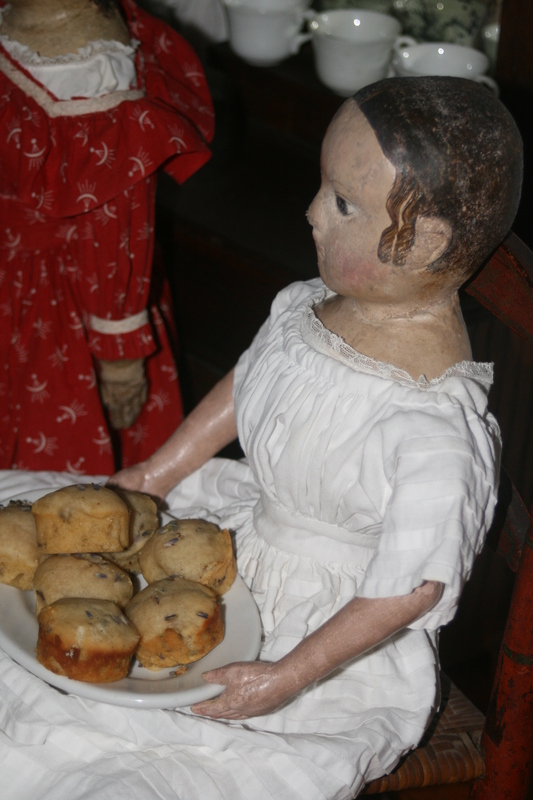 She will also be featured in a series of upcoming posts that will chronicle her restoration adventures. 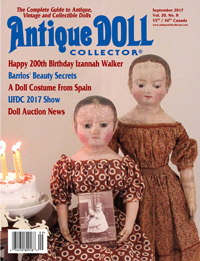 Thank you very much for inviting me to Izannah Walker’s 198th birthday party. I am having such a good time visiting! 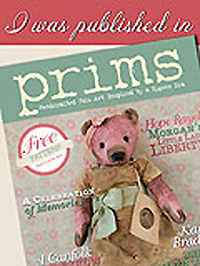 Of course you know how much I enjoy admiring the tea party finery with cartridge pleats and scalloped sleeves. 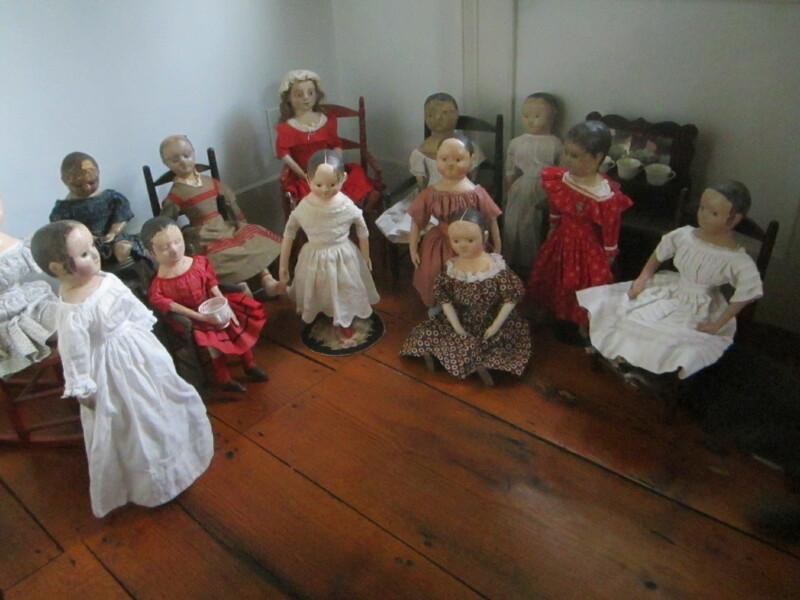 And with Joy Harrington’s article about her Izannah house, I am so inspired and excited to see your doll house furniture and displays! 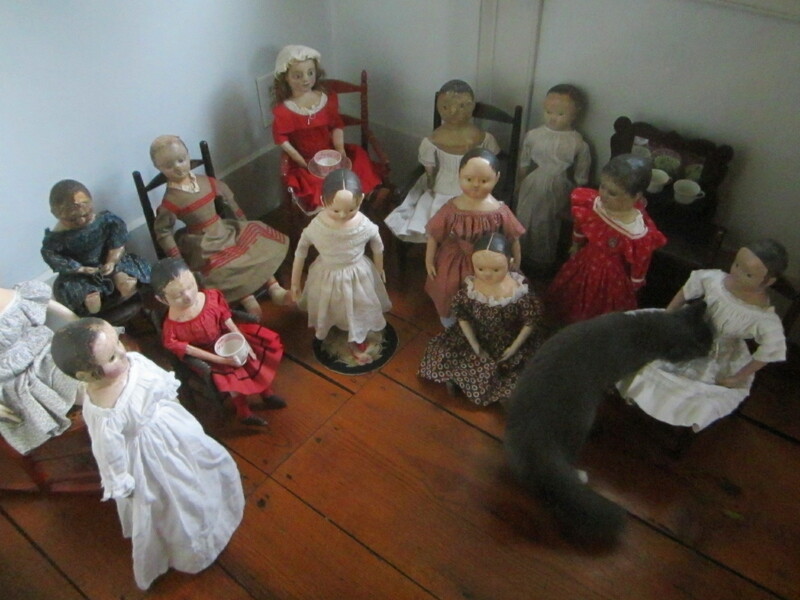 I had to go back and look at your photos of Edyth O’Neal’s closet doll house too. Thank you, also, for offering tea on your very fine London type tea porcelain. 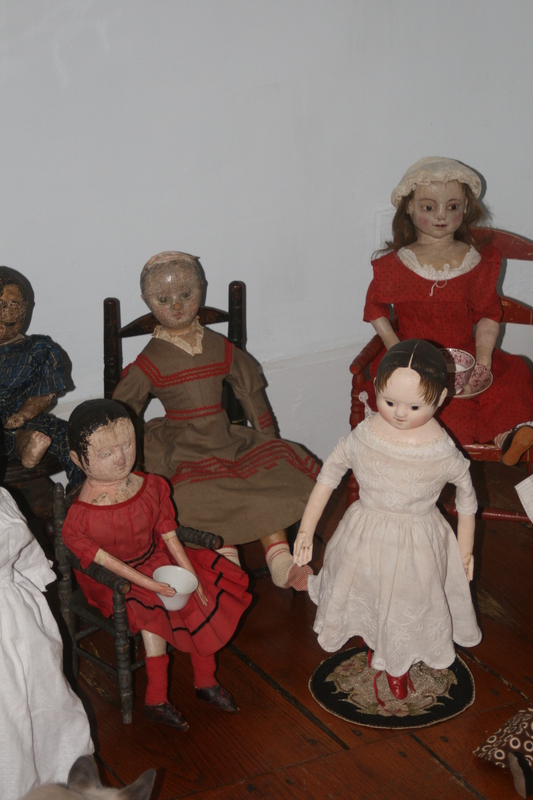 Antique toy Staffordshire is my newest pursuit so I am learning all about it now and enjoy seeing lovely examples such as you have here. 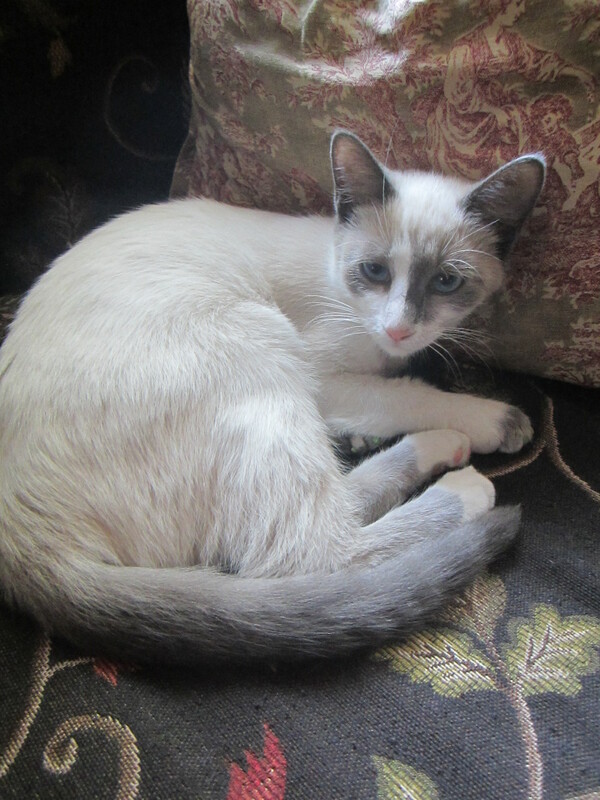 Kitties are quite welcome at tea by me, so getting to know yours was a treat. 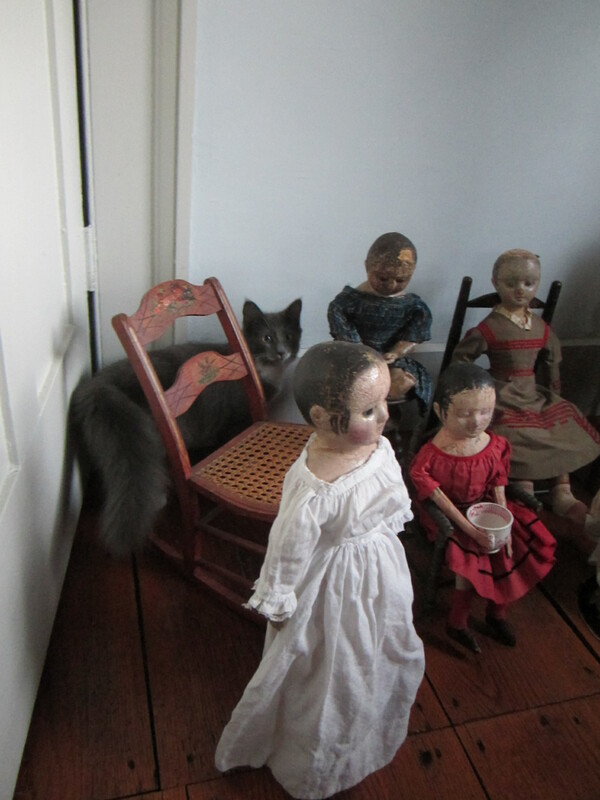 Now, it is only good manners to invite you to my place as well. 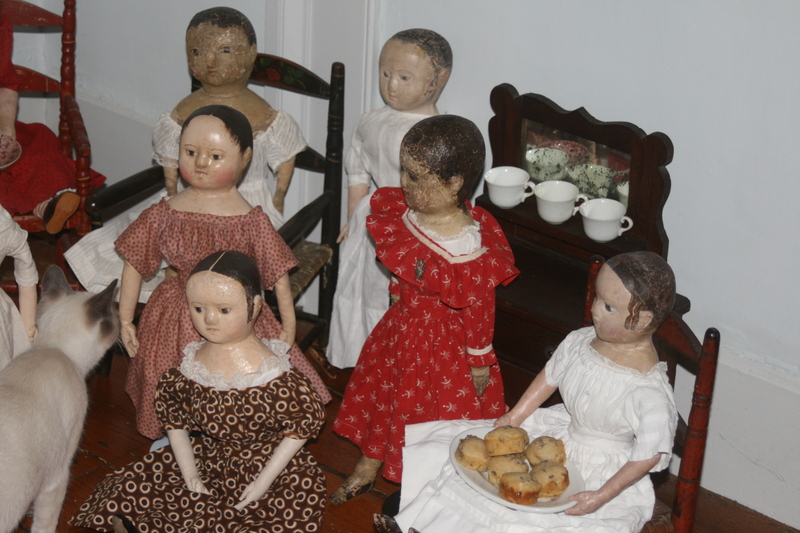 In a few days I will be offering my first of a series of posts about doll-size doll house displays and accessories, including staffordshire dishes. 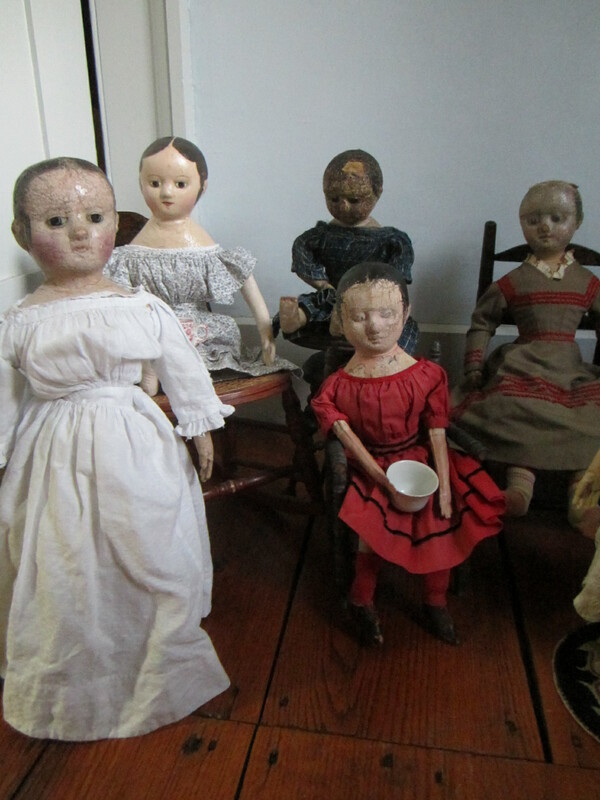 Though my collection is not as fine as yours, I do look forward to sharing it and my thoughts about it. 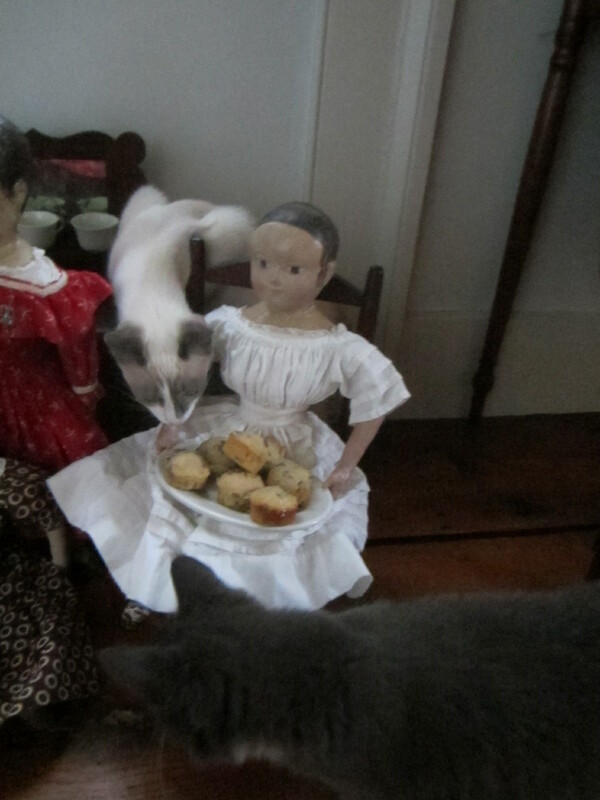 My two 1 year-old cats like to bat the wooden doll toys and steal the teapot lid from my displays! 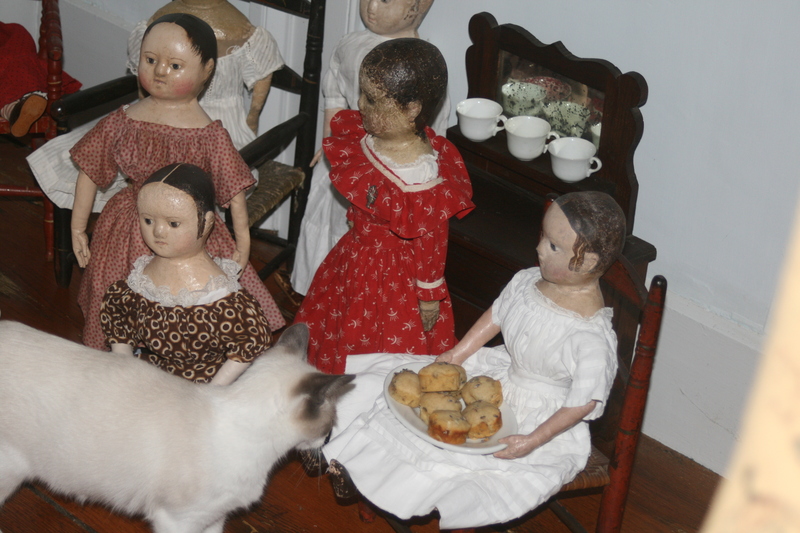 We will be serving tea as well, and a special treat desired by all, kitties included–Spice Mice Cookies! All of the girls send their love to Ruby! 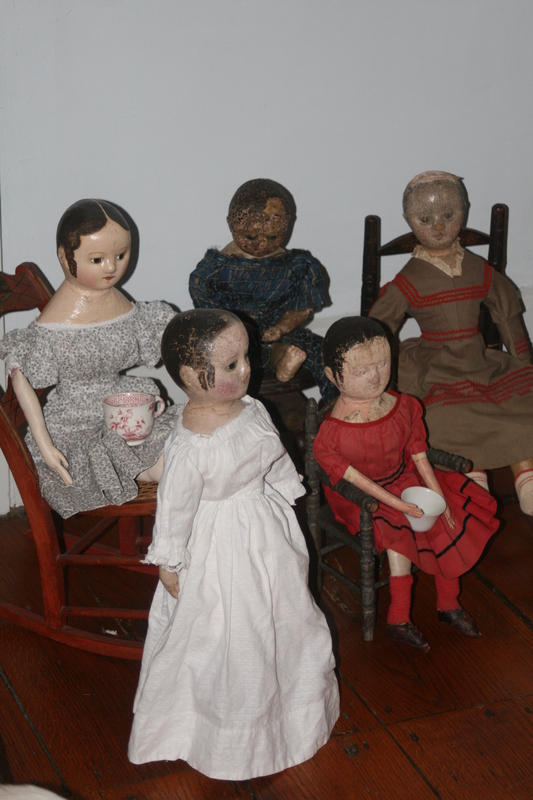 So happy you could stop by and join us for tea! I’m looking forward to reading about Spice Mice!